An absolutely "Must Read" this summer is the Minute Millionaire by Mark Victor Hansen and Robert Allen. It is a uniquely written book that teaches the key principles that can lead you to financial freedom. Whether you enjoy a book that is a "story" or a book that discusses how to apply concepts, you will find that this book will grab your attention. The right-sided pages are written for those of us who prefer the more instructional approach. The left-sided pages are designed for those of us who prefer the "storybook" approach. Together, the pages of the book keep our attention and also teach us the "how to's". It is a real winner in keeping your attention and teaching you how to achieve your financial dreams. go for it now!!! I found a great product that teaches you how to set up and maintain your own blog in several easy-to-do and understand steps. Everyone should have their own blog. I also found another great product that you must have if you own a computer. It is an outstanding data protection service that provides on-line backup. Another website I liked is The Original PDF Creator. Being able to create your own pdf files using any program is criticla today. Building and maintaining relationships across all of the socail networks will help me to establish myself and my company. Right now, everyone needs trusted, proven, practical advice and techniques for making money fast. In Cash in a Flash, two of the most successful entrepreneurs in the country show readers how to use the skills and resources they already have to generate permanent and recurring streams of income—all in 90 days or less. Using their bestselling “two-books-in-one” formula, Hansen and Allen combine prescriptive information for developing the millionaire mindset and building wealth on left-hand pages, with the continuation of the inspiring fictional story of Michelle from The One Minute Millionaire on the right-hand pages. 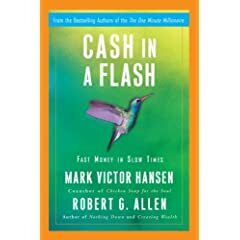 In this much-anticipated and timely sequel, Hansen and Allen provide a revolutionary approach to financial freedom—now. I introduced my clients and contacts to a new offering: On-The-Spot Coach which provides leaders and entrepreneurs with the opportunity to obtain one-on-one coaching when they need it for situations thaey are facing that day. The coaching is "On-The-Spot" and can be related to any situation, challenge or idea that they woudl like to discuss. Clients are reacting with a lot of excitement. I have learned that it is important to utilize all sources of marketing, including direct mail, email, live networking and social networking to make noise on my business and products. Social networking opens up the opportunity to connect to many more people than an individual can do utilizing the more traditional marketing methods. I cannot believe that it is already mid June and that summer is underway. Having a high school graduate is a new experience. I visited the college campus with my son as he registered for his classes this week. I was reminded of the excitement and the anxiety that comes with change as I watched my son's mood change throughout the day from "okay I have to do this" to "I love this place and can't wait to be here!" As I think about the changes I have been making to my business and my life, I can say I have also felt that anxiety- "Okay, I have to do this." And now I can say "WOW, I am really loving this "makeover" and I can't wait to get it all going!"